Well, it's been a while and a lot is happening right now and in the near future with regards to all things written, so I thought I'd take some time and update everyone on what's going on in the world of pseudo-fame, micro-fortune and the occasional royalty check. So, here goes. In regards to royalty checks, it's not something I like to make real public, but thought I'd share this story of my first check. I got it the first week of October. My publisher sends them out quarterly. I opened it with great anticipation, trying to get a gauge on whether I could retire early or maybe pay off a month of Sarah's college tuition. To my surprise, it was ridiculously low, like just over $150. What the heck? I was shocked and dejected. Well, after looking closer at it, I realized that it was for the Quarter ending June 30th. The book was released June 17th. The check was for a two week period. Whew! I won't get my first full quarterly check until after 1/1/2015. Then I'll be lighting my cigar with twenty dollar bills. (Or as my friend Pat always said, "You'll make fifties and fifties of dollars as a writer". He wasn't far from wrong. Tomorrow the Southeast Wisconsin Festival of Books begins. It is a two day festival that features over 70 authors, presentations, food and great chances to network with local writers. The keynote speaker on Saturday is one of my favorite contemporary writers, Michael Perry. I plan to get a couple of his books signed and look forward to his keynote. His stand-up routine is worth coming in itself, let me tell you. I'll be there too speaking on panels titled "The Flexible Writer" (writing across genres) and "First Time Book Writers". Times are 9:00 and 1:30, with a Dirty Shirt book signing at 2:30. Hope to see you there! 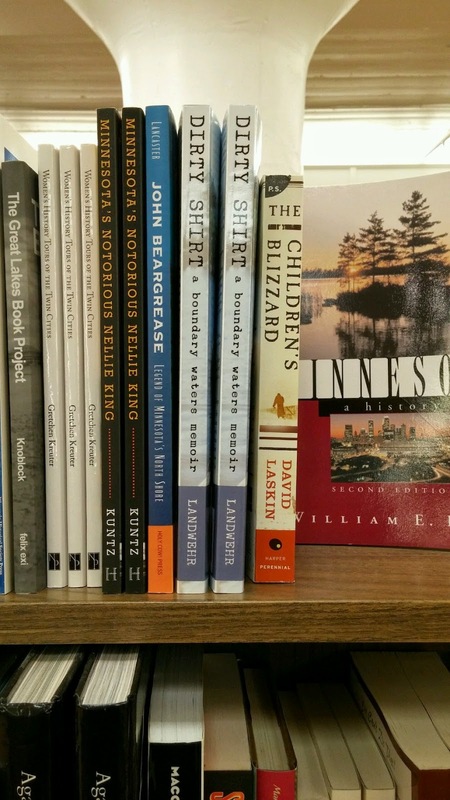 In a kind of fun thing, my daughter found my book on the shelf at the University of Minnesota Bookstore today. She is a student there and it is my Alma Mater (1985). She knew it was there, so went looking for it. It is these kinds of moments that make the whole writing process, with all of its effort and commitment worthwhile. 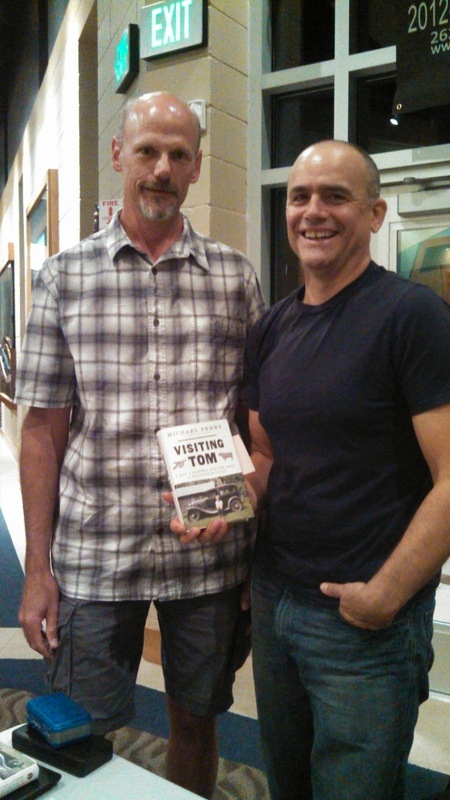 My Meet the Author event at the New Berlin Public was a blast. If you know me, you know I'm not a big fan of public speaking, but for some reason, when it comes to this book (or other writing-based readings I've done) I seem to do very well. I felt comfortable, made the crowd laugh on several occasions and they were even kind enough to ask some questions at the end. I loved every second of it. I would do it again in a minute. (Contact your local library for me. LOL). In a little over a month I'll be in St, Cloud, Minnesota leading the Granite City Book Club in a discussion of my book. I am looking forward to hearing from people that don't know me. I want to know what they think and this group is the perfect audience for it. My dad grew up in St. Cloud and I have a number of great memories from the area. Hopefully they're nice to me. Ha! I am continuing to work on my next work, a poetry collection. I'm shaping up some older poems and still getting a new one written here or there. My topics are all over the map, from teenagers, to tree killers, to working in government. I'm having a blast with it and feel passionate that this is an important extension of my writing career. I've got a friend I want to do the cover, and still haven't chosen a title, but it's coming together. And finally, I've been successful in getting my book in over 21 libraries. This is all my doing, it doesn't just happen on its own. It's part of my plan to make sure it is accessible all over the states of Wisconsin and Minnesota. It's hard work, but one I'm lucky to be able to do, so I just chip away at it when I have time. Here's a list of where it is available thus far, with more pending. I have to add that all of this, every bit, has been an absolute blast. Hard work in some cases, but so much fun along the way. Not too shabby for starters.